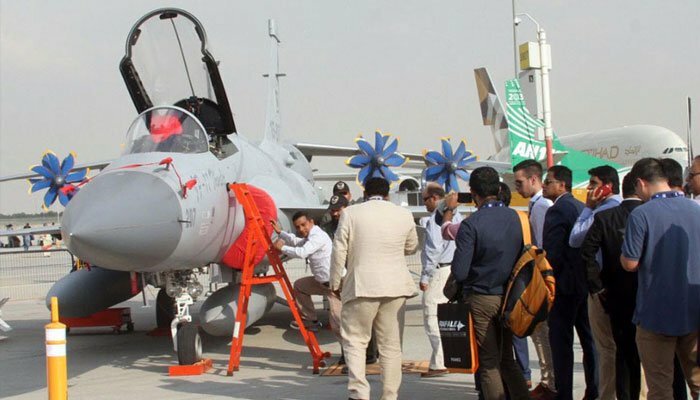 On the twilight of Dubai Air Show, a large number of spectators thronged the PAF pavilion to see the static display of JF-17 Thunder and Super Mushshak aircraft. Being an open day for general public, aviation enthusiasts turned out in thousands to see the sleek and lethal fighter aircraft, rightfully called the Pride of Pakistan. The eager spectators were briefed about the various capabilities of this aircraft. Another salient feature of the event was the scintillating aerobatics display by JF-17 Thunder and Super Mushshak trainer aircraft, which presented breathtaking maneuverer during the aerial display. JF-17 is a state of the art fighter aircraft, offering outstanding flight performance and strong operational capability. Designed and developed as an affordable and cost effective fighter, it provides cutting edge capabilities at an affordable cost. JF-17 Thunder has successfully participated in various reputed air shows all over the world including Farnborough Air Show, Paris Air Show and Zhuhai Air Show. JF 17 seems to be good. Lots of accolades from around the world. Hats off to all the people involved. اس میں جے ایف 17 تھنڈر کہاں ہے؟ ہماری بے وقوف اور ان پڑھ میڈیا کو یہ نہیں پتا کہ جے ایف اور مشاق طیارے کونسے ہیں۔!